You're squinting and rubbing, but your tired eyes continue to torture you. And it's no wonder they're sore: how many hours a day do we all stare at a screen? someone say something that really annoys you. To start off with, you can either sit or stand. Relax your shoulders, straighten up your neck, and look ahead. Look to your left and then slowly roll your eyes up towards the ceiling. Keep rolling them to the right and from there, to the floor. Do it clockwise 5 times and then the other direction another 5 times. Repeat 3 of these cycles. To achieve even better results, close your eyes as you're rolling them. This helps lubricate your eyes and eases the strain on the muscles. body muscles (and showing off!). You can also use it to make eye muscles stronger. And here's how to do it: sit on a comfortable chair and look straight ahead. Then move your eyes up without changing the position of your neck. After that, move your eyes down. Do 10 reps for this one. Then look to the right as far as you can, and repeat 10 times. Do this whole eye-flexing cycle 4 times. eyes while taking a deep breath. Place an index finger on each eyelid and apply very light pressure for 10 seconds. Let go for 2 seconds and then press gently again. That'll be 1 rep, and you'll do 10 of them. As you can guess, it's important to be very careful while performing this exercise. You can hurt your eyes if you press too hard. screen can make you forget to blink as often as you should. That's why your eyes get red, sore, and irritated. it to relieve tired eyes. Find a blank wall to eliminate any possible distractions and sit in front of it. Keep your neck straight and your shoulders low. Close your eyes and wait for 30 seconds before opening them. or lying down and look straight ahead. Without moving your head or neck, look to the left as much as you can. Keep your eyes in that position for 3 seconds. Now look in front of you for a second. Move your eyes to the right as far as you can, and hold them there for 3 seconds. Repeat this whole set 10 times. Rub your hands together, and you'll look like you're scheming some evil plot! Bouncing Imagine that your eyes are bouncy balls. All jokes aside, this exercise is a fun one, and you can do it even while chilling in bed. So take any position that's comfortable for you and look ahead. You can do this exercise either with your eyes closed or open. Your task here is to start moving your eyes up and down as quickly as you can. Do it 10 times and then take a 5-second break. relaxing massage after a tough day of, well, seeing stuff! Plus, this one is really good for dry eyes. Anyway, to do it, sit in a comfortable chair and loosen up your shoulders. Tilt your head back a bit and close your eyes. direction, but the other fingers on your right eye counterclockwise. After 10 reps, switch up the direction on each eye. then this exercise is definitely for you. Place a chair near a window and take a seat. Put your right arm in front of you and stick your thumb out. First, you should focus on the tip of your thumb for 2 seconds. Then focus on the window for the same amount of time, but don't move your hand. And lastly, focus on some object out the window for 2 seconds, like a building or tree. Then shift your focus back on your thumb. Do this cycle 10 times. Well, it's a little different, of course! Not to mention, it's just so calming and relaxing! First, sit on a chair and rub your hands together for a bit to make them warmer. Take deep and steady breaths and relax as you feel the tension leave your eyes. To achieve the best possible result, do this exercise for 5 minutes. For this one, you'll need a pencil (a pen, of course, will do too). Sit in a comfortable position on a chair and keep your neck and head straight. Hold the pencil in your right hand and press the eraser-end to the tip of your nose. Focus your vision on the eraser. Then, start slowly extending your arm while keeping your eyes on the pencil. Again, 10 reps will do the trick! To do it, you'll need a blank wall and… a bit of imagination. Then rotate that number sideways and start slowly tracing it with your eyes. But keep in mind that you shouldn't move your head. Trace the 8 upright for 2 minutes and then sideways for another 2 minutes. of you at both sides. Focus your vision on the tip of your right thumb for 5 seconds. Finally, move your eyes to the left thumb for 5 more seconds. When you're done, go back to the distant object and then the right thumb. You'll do that 10 times as well. 10 feet away, and get ready to use your imagination. What you'll do is write invisible words on the wall using only our eyes. You can even write secret messages! Hey, nobody will know what you're writing with your eyes – that's the fun of it! your vision sharp is to avoid things that lead to eyestrain. How many hours a day do you spend looking at your mobile screen or computer? 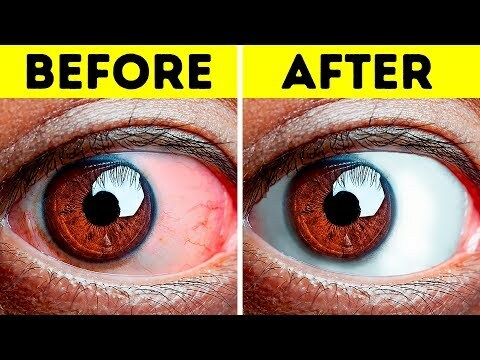 Let everybody know down in the comments what you do to deal with tired eyes. Don't forget to give this video a "like," share it with your friends, and click "subscribe"
to always stay on the Bright Side of life!